The shadows hold their breath as the parade of gargoyles descends past you on your grim trek to the underworld. 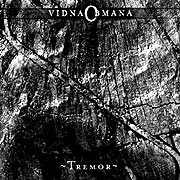 So begins Tremor by Vidna Obmana, a penetrating sonic rendering of a passage through the lower world. At times challanging, aggressive and vehement, elements of recent albums manifest themselves on Tremor and are covered in thorns. This album is a step closer to the dark edge of electronic music and presents exotic percussion loops, complex synthetic waves and an overtone flute so processed, looped, shifted, exaggerated and distorted that it's expressive sound folds inside out. By its nature, music is more immersive than film, video or other media. There are no barriers to music and it's impossible to stay outside of it. Vidna Obmana makes the most of this virtue. He's deeply attuned to his material and takes us with him on a journey into darkness. The listener is left with the sense of a smoldering landscape. One can almost smell the brimstone.